I usually don’t post on a Tuesday, but this idea was too good to hold onto. Awhile back, I was listening to Pandora and the Pink Floyd song "Another Brick In The Wall, Part 2" came on. As I listened, I realized this could be perfectly adapted to the current school situation. After the recent events with Commissioner John King, it just made even more sense. If you need a reminder of what the lyrics really are, check them out here or watch Pink Floyd sing the song. One last thing. I’d video myself singing this except: 1) I’m not the best singer around and 2) I’m currently battling something and am losing my voice. Feel free to video yourself singing these lyrics and post them online. Let me know if you do and I’ll link to them. We don’t need to test ad nauseam. We don’t need no Common Core. Hey! Pearson! Leave our kids alone! All in all it’s just setting our kids up to fail. All in all you’re just setting our kids up to fail. Hey! John King! Leave our kids alone! "Wrong, You fail the test!" "If you don’t take the test, we don’t know if you’re learning. How can we know if you’re learning if you don’t take the test?" "You! Yes, you teacher. Stop teaching creatively!" Here’s hoping Pearson, NYSED, and Commissioner John King leave our kids alone soon. 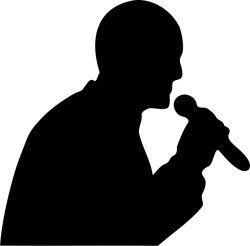 NOTE: The "man with microphone" image above is by laobc and is available from OpenClipArt.com.